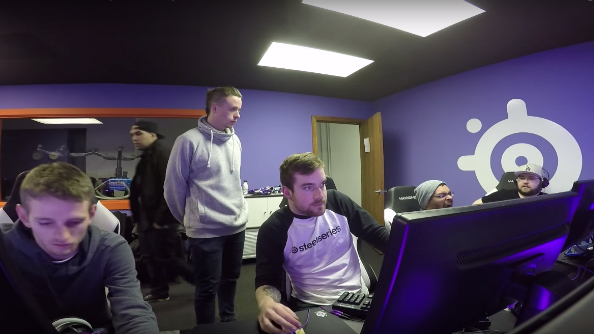 E-sports sponsorship deals have come a long way from hiring Fatal1ty to apologetically hold up a motherboard – peripherals manufacturer SteelSeries have announced that they’ve moved the Winterfox CS:GO team into their Chicago HQ. There, they’ll train as normal in conjunction with SteelSeries staffers, and provide insight and feedback on new products. Presumably Winterfox are a lot happier about it than they’re letting on in the above pic. Wanna be as good as Winterfox? Our CS:GO tips are the first step on a long journey, friend. The enthusiast end of gaming hardware has been awash with sponsor ship deals with pro players for years, their autographs and awkward smiles emblazoned on everything from headsets to mice to motherboards. Some manufacturers have even hired the pros as consultants, who help them shape the overall look and feel of a given gaming doohickey. But this deal is a bit different. Winterfox’s CS:GO team are literally working within SteelSeries HQ each day, as the video above demonstrates (along with their commute, for some reason). That suggests the sponsorship deal doesn’t just extend as far as a single product. Alex ‘LeX’ Deily, Todd ‘anger’ Williams, David ‘Xp3’ Garrido, Kyle ‘flowsicK’ Mendez, and Derek ‘desi’ Branchen are all enlisted to work with SteelSeries personnel as they train daily in their own suite. It looks a bit smaller than I would have imagined. One thing the announcement doesn’t address, so far at least, is the end goal. You can expect to see something emerge from the SteelSeries fold with Winterfox branding on it, but what? A mouse designed to cope with CS:GO’s specific demands? A headset tailored to bring the very best out of the C4 bleeps and knife swishes? Who knows.